Kampala Capital City Executive director, Ms Jennifer Musisi has resigned over yet to be known reasons. Ms Musisi who has been at the helm of the Authority for about seven years on Monday wrote to President Museveni indicating her intention to resign. "This is to submit my resignation from the position of executive director, Kampala Capital City Authority with effect from 15th December 2018. Your excellency, over the last seven and half years, we have made progress towards transforming Kampala," writes Ms Musisi in 21 paged letter. Her letter comes just hours after she signed a Memorandum of Understanding (MoU) with jhpiego, an international, non-profit health organisation and affiliate of The Johns Hopkins University, USA to bring relief in Health care provision for communities in the city. 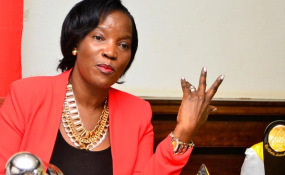 In an interview with Daily Monitor recently, Ms Musisi admitted that managing Kampala has not been an easy walk, but said KCCA has made significant changes in laying a foundation to transform the city. Ms Musisi was appointed executive director in April 2011 after a law was introduced to create KCCA, headed by an appointed Executive Director, leaving the Lord Mayor as a nominal political head without power and control over the city's finances. She was identified at Uganda Revenue Authority (URA) and appointed the first KCCA executive director to transform Kampala city to the standard of the President's dream. However, it was not an easy task to accomplish. Ms Musisi had inherited an institution whose integrity and public reputation had been severely bruised because of scandals of corruption, property wrangles, uncollected waste, pot-holed street roads, political wrangling and sheer inefficiency. In 2017, President Museveni extended her contract until 14 April 2020.